Just a quick Fossil of the Week post. Above we see isolated columnals (stem units) of the crinoid Isocrinus nicoleti (Desor, 1845) found in the Co-Op Creek Member of the Carmel Formation (Middle Jurassic), Kane County, southern Utah. Greg Wiles recently received them as part of a donation to our department collections. They have such perfect star shapes that I had to share them here. For the full analysis, see my previous entry on columnals like these preserved in a limestone from the same location. Baumiller, T.K., Llewellyn, G., Messing, C.G. and Ausich, W.I. 1995. Taphonomy of isocrinid stalks: influence of decay and autotomy. Palaios 10: 87-95. Tang, C.M., Bottjer, D.J. and Simms, M.J. 2000. 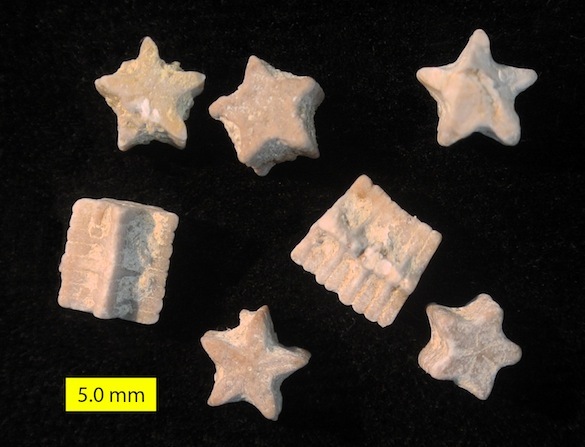 Stalked crinoids from a Jurassic tidal deposit in western North America. Lethaia 33: 46-54.